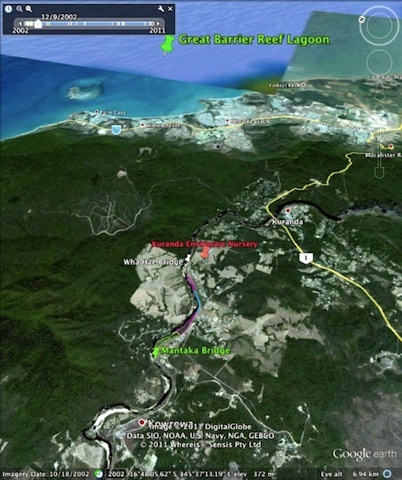 In 2012, Kuranda Envirocare received a grant from the Australian Government, under the "Clean Energy Future" program for a five-year project to connect the Envirolink and Fairyland Corridors along the Barron River. The area will be cleared of guinea grass & weeds, then trees planted at 1.5m intervals. It will be maintained to eliminate competing weeds until canopy cover is reached. Local native rainforest seeds will be propagated in our community nursery. Community engagement to promote owner revegetation on private land in wildlife corridors will be undertaken. This project will connect a completed 14 year project (revegetation of the regional priority Envirolink Wildlife Corridor intersection with the Barron River linking the north and south sections of the Wet Tropics World Heritage Area with completed revegetation of the area around Warril Creek, which in turn connects to the Fairyland Link Wildlife Corridor, a nationally important biodiversity hotspot with three endangered species. The Myola area centred on Warril Creek is a nationally recognised biodiversity hotspot and site for speciation recovery. The improved water quality of runoff water into the river will directly improve survival and breeding outcomes for the local endangered frog species, Littoria myola and Littoria rheocola . The Myola link is between Wha Hae bridge and Mantaka Bridge. Ultimately, improvements to the Barron River riparian will also improve the quality of water flowing into the Great Barrier Reef Lagoon, illustrated above.